The recent years of economic crisis in Spain have had two major consequences in the political landscape: the arrival of progressive political movements and the collapse of the two-party system. At the same time, a sovereignty movement, with the ability to mobilise large sectors of society, has emerged in Catalonia. As the referendum approaches, the central government has multiplied its efforts to stop it from taking place, raising again the spectre of franquismo in the collective memory. 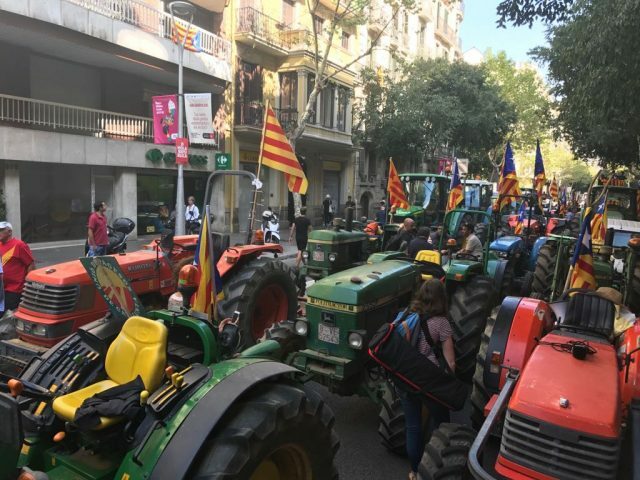 This has been met with widespread opposition and paradoxically a growing wave of solidarity with the right to self-determination has been seen. In light of all this, the holding of the referendum will take place in very uncertain circumstances, besieged on one hand by denouncements, seizing of electoral material and arrests from the central government, and on the other with large mobilisations and calls for disobedience from the Generalitat (the Catalan government). What is at stake on October 1st in Catalonia? To address this we have interviewed Joan Tafalla, History professor and member of Espacio Marx. The Spanish government has reinforced the police presence in Catalonia. Do you think this may put a stop to the referendum? In which way? I think the strong police presence in Catalonia will be overwhelmed by the large masses that are participating in the process, organising in this moment, occupying schools and keeping them open until Sunday. The Mossos (police force of Catalonia) have been ordered to shut down schools and keep them closed, and the remaining police forces from the state are deployed in Catalonia to maintain law and order. But this deployment will not be able to contain or dissuade people from their expressed will to vote. How would the Catalan society react if faced with the impossibility of casting a vote? Catalan society is something larger and more complex than the popular movement for independence. In what concerns the latter, I have said: it will overwhelm any effort from the repressive forces of the state to contain it. There is the possibility that the local Catalan police will act in a way that is not too forceful and even somewhat permissive, at least until Sunday at 6 in the morning. With respect to the sector of Catalan society which, for multiple reasons, does not take part in the popular independence movement we are yet to see their reaction after almost seven years of this independence process. It is still early to know which attitude this segment of the population will adopt. We only have the data from a recent poll from the Centro de Estudios de Opinión: the sectors which are economically weaker and most recently arrived in Catalonia show a high level of rejection towards the goal of independence, but not towards settling the matter through a vote. What consequences could the referendum have for the other peoples in the Spanish state? I think that, as an essentially democratic movement, the movement for self-determination is now causing a certain breach in the regime created by the transition of 1978. It is probable that its example will allow for a reactivation of the independence movements in Galicia and the Basque Country. Now, in the remaining regions of Spain it may generate a certain resurgence of Spanish nationalism, that may allow the PP (Popular Party, currently in government) and the PSOE (Socialist Party, main opposition party) to hide their corruption and their inability to present any future prospects for Spain. In any case if Spain wants to preserve its unity as a political country (formed in turn by various countries and peoples) it can only do it if it manages, in a democratic way, to remove the Popular Party from power and open a constituent process that gives the peoples the right to self-determination. And once their will is heard, a free union in a Federal Republic can happen. The future of Spain, as a political entity, can only happen through a radical, democratic and de-centralising constituent process. What is the social composition of the independence movement? I have talked about a popular independence movement. But this description does not describe the independence movement in its entirety. Along with popular and working class sectors in the independence movement there are bourgeois sectors (essentially petty and medium-scale bourgeoisie), which have been leading the process up to now, and as such imprint their ideological and cultural orientation. Certainly the big Catalan bourgeoisie is not for independence and is looking for a pact between elites that will re-establish the balance of power between the multiple fractions of the Spanish bourgeoisie, which has been broken. What are the economic interests at stake? The reasons for the break among the dominant classes are various: the unbalances in the commercial and fiscal balances, or the intensification of the industrial/commercial competition between different Spanish territories. For example, the competition between the Madrid and Barcelona airports, the issue of the Mediterranean corridor or the management of the Barcelona and Tarragona ports… at a time when Catalonia has ceased to be an industrial locomotive in Spain. All of this suggests a number of conflicts and complex interests that make it so that the solution of the conflict is resting on corporate interests that are very contradictory. In summary, the globalisation of the economy leaves little room for a pact among the elites. If on top of this we add the clumsiness with which this process has been handled, from a political standpoint, the situation becomes even worse. Add to that the mobilisation of popular sectors, which will not be easily brought back down… and we realise that we have an uncertain scenario in front of us. Is there a lesson from history that might be useful to recall in this context? The modern political nations are imagined communities created on the back of bourgeois revolutions. In Spain the creation of the political nation was flawed, in complete opposition to what happened in France or Germany. It has often relied more on coercion than on hegemony. If Spain is to survive it needs a radical change, a democratic break that the elites are unwilling to stomach. It is all in the hands of the popular initiative.